Thousands joined the school student strike for climate on 30 November. “If you were doing your job properly, we wouldn’t be here,” Deanna Athanosos, a year 10 student, told Prime Minister Scott Morrison. Despite increasingly urgent warnings, world leaders are failing to act. A new UN Emissions Gap report has found that major countries including Australia, Canada, the US, the EU, South Korea, and the US will all miss even the woefully inadequate emissions targets they signed up to at the 2015 Paris climate summit. Emissions reduction efforts need to be increased five-fold to hold warming to a safe limit of 1.5 degrees, it said. That’s the background to Adani’s announcement it is going ahead with its new coal mine in Queensland. After failing to find investors willing to fund the mine it says it will self-finance the project from its own funds. Adani has been forced to dramatically scale down the mine. Its CEO Lucas Dow claims it will “ramp up” over time to less than half the size first announced. Initial production will be just one-sixth what was planned. The scale of the climate crisis means all remaining coal and gas needs to stay in the ground. We need a transition to 100 per cent renewable energy as quickly as possible. Scott Morrison and the Liberals are captive to the climate deniers. They now have no climate policy at all, after dropping the National Energy Guarantee. Resources Minister Matt Canavan’s response to the Adani announcement was typical, welcoming it as “great news”. Labor leader Bill Shorten has announced plans for a 45 per cent reduction target by 2030, and funding to help ensure 50 per cent renewable energy by 2030. But he also says, “there’s still a role for coal and for gas in our energy mix going forward”. Labor has refused to commit to stopping the Adani mine if it wins government next year. And part of Shorten’s November funding announcement was $5 billion for electricity transmission infrastructure, including an expansion of gas pipelines. But gas is not climate friendly. Mining gas releases large amounts of methane, meaning it is just as bad for the climate as coal. Labor’s support for gas means an expansion of fracking, in a challenge to the campaigns that have halted it across the country. This would also require over-riding many Aboriginal people trying to defend their lands. Before Adani can proceed for example, the Queensland government would need to extinguish Native Title rights. The NT government lifted a moratorium on fracking earlier this year followed by the WA Labor government in November, in defiance of the party’s own State Executive. In NSW Santos is pushing to begin fracking in the Pilliga forest. Australia needs to reach net zero emissions by around 2040, according to the Australia Institute. We know this is possible. New wind and solar power are now cheaper than building coal plants. The Tesla big battery in South Australia is one example showing how battery storage can see them deliver 24 hour power. But winning this requires building a mass movement that challenges the logic of capitalism and the market. Energy companies care only about profits. Relying on a market mechanism, either Labor’s adoption of the National Energy Guarantee or a carbon price as proposed by The Greens, would see coal mining communities devastated by job cuts and risk higher power prices. Labor’s carbon tax failed to win public support because it meant increased power bills for ordinary people. We need an immediate government plan to roll out 100 per cent renewable energy, as well as dramatic investments in public transport to slash vehicle emissions. The big companies who have profited from polluting the planet should pay the costs—through taxing the rich. We need to fight for government investment and planning to make sure this means more jobs as well as cheaper power prices. These are the kind of demands that can build a mass movement for climate action. 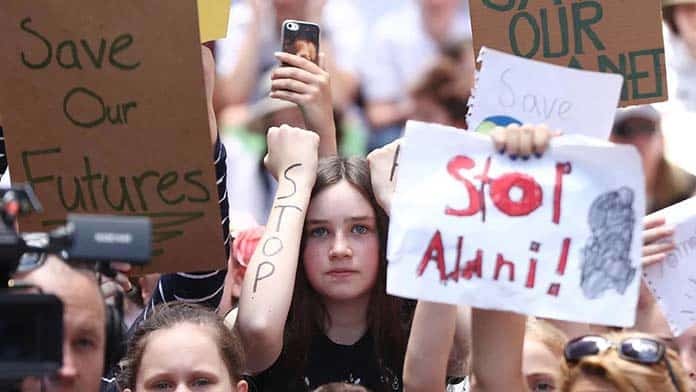 Solidarity spoke to student who walked out of school for the Student Strike 4 Climate in Sydney last week. I’m here today, and so is everyone else, to urge our politicians to take immediate action against climate change because we’re all seeing it as the problem it is. And it’s so frustrating to see that those in power just don’t seem to care, or care about the coal lobbies. We think it’s important that our politicians know what’s important for our future. They have a huge responsibility to act on what really matters. We’re the generation that are going to be affected by climate change and we need to show our politicians that we know that, we are not going to just sit down and do nothing. It’s disgraceful that the government is doing nothing about a problem so massive and affecting the whole world. We can see climate change all around us happening already, why is there a dust storm, flooding, fires all in the space of two weeks. There’s obviously something happening and the government just refuses to do anything about it. We think they should, that’s why we’re here. What do you think the power of protest and collective action is? Soon we’re going to inherit this world, the future generation. Since we can’t vote, our voices need to be heard. By pulling off something as big as this, by bringing all the students together today, it just shows the politicians aren’t doing their jobs, and they need students like us to say something. When everyone gathered here today, everyone came here to support this cause and to fight for this, it really showed me that you can make a difference. Every single person coming out today can make a difference, and can show the government that what they’re doing is wrong.